Many are proclaiming the iPad a Kindle killer—but it seems no one told Amazon. The e-book vendor updated its free Kindle app to add compatibility for the iPad, and it’s now available for your reading pleasure. And since the Kindle app is Universal, the same app will run on both iPhones and iPads. 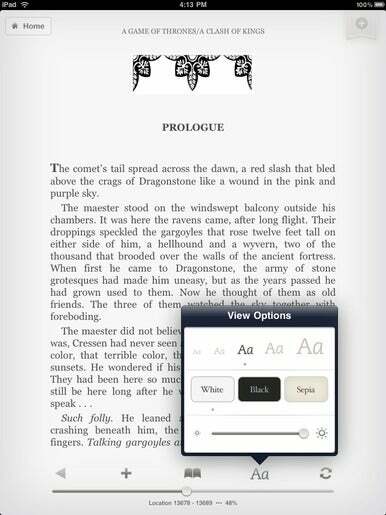 The iPad version of Kindle includes a spiffy page-turning animation (why should Apple have all the page-turning fun?) as well as an option to turn off the animation (for which I thank the Amazon developers kindly). The library view on Kindle for the iPad displays large thumbnails of the books you have available to read and is both scrollable and pinchable. Entering notes, bookmarks, and highlighting words are all done with a touch, and you can adjust the brightness of the screen from within the app. The Kindle app also supports Amazon’s Whispersync technology so all your bookmarks, notes, and position remain synced across all Kindle apps and hardware. But the biggest feature of Kindle for the iPad is probably Amazon’s enormous stock of e-books. Amazon claims more than 450,000 title are available for the Kindle while the iBook store currently has only about 60,000 titles (a number that is sure to grow in the coming days, but you shouldn’t discount Amazon’s head start). You should note, as Amazon does in the Kindle app’s description, that the iPad version of Kindle hasn’t actually been tested on a real iPad. It seems Amazon wasn’t one of the few companies to get a sneak peek at the iPad. I wonder why that is?